Bloomingdale is a neighborhood in the Northwest quadrant of Washington, D.C that is less than two miles north of the United States Capitol building. It is primarily residential, with a small commercial center near the intersection of Rhode Island Avenue and First Street, NW featuring bars, restaurants, and food markets. Most of Bloomingdale’s houses are Victorian-style rowhouses built around 1900 as single-family homes. Today, these houses remain primarily single-family residences, with some recently converted to two-unit condominiums. Bloomingdale has its own community-managed and community-owned greenspace, Crispus Attucks Park. The acre-and-a-quarter park, located within the court bounded by First, U, V, and North Capitol Streets N.W., was previously the site of a telephone switching station and cable yard for the Chesapeake & Potomac Telephone Company. In the late 1960s, the building and the site were left vacant until 1977, when a neighborhood organization that ultimately became the Crispus Attucks Development Corporation convinced Chesapeake & Potomac to sell the property. Important Note: Because of its low-lying topography, flooding had periodically occurred in parts of the neighborhood during particularly strong rainstorms. Bloomingdale is bounded to the north by Channing St., N.W., to the east by North Capitol St., to the south by Florida Ave., N.W., and to the west by Second St., N.W.. The neighborhoods bordering Bloomingdale are LeDroit Park to the west, Shaw to the southwest, Truxton Circle to the south, Eckington to the east, and Stronghold to the northeast. To the north, sit the McMillan Sand Filtration Site and the McMillan Reservoir. The neighborhood is a low-lying area, located at the foot of hills that extend to the north and east. Its topography is also shaped by the now-buried Tiber Creek, one branch of which generally followed what is now Flagler Place NW. The present-day neighborhood of Bloomingdale originated from several large estates. 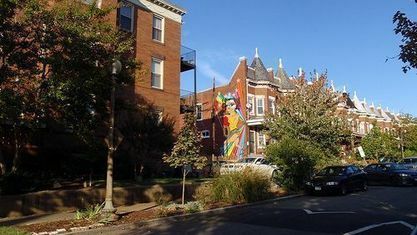 Located just outside the original boundary of the City of Washington as designed by Pierre L’Enfant in 1792, and in the former County of Washington, the neighborhood known today as Bloomingdale began to develop its residential character in the late 1880s, shortly after the County of Washington was absorbed by the City of Washington, and just over a century after L’Enfant’s plan was developed. The lands that comprise Bloomingdale first began as large estates and orchards. As late as the 1870s, the land where Bloomingdale now sits was largely a collection of undeveloped private estates and farming properties, most prominently those of the Beales and of the Moores. Following Emily Truxton Beale’s death in 1885, her heirs began to sell large tracts of the estate to developers. 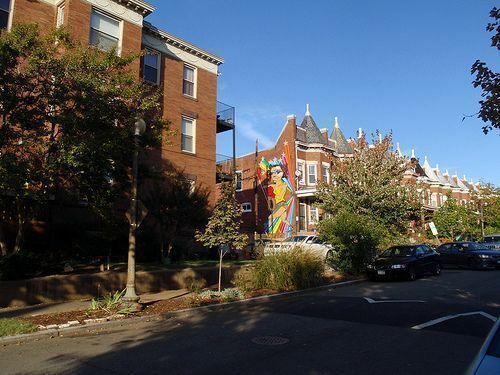 The old Bloomingdale estate rapidly changed into the modern neighborhood configuration as developers and land speculators transformed the undeveloped lands for denser residential development, located between the already established residential LeDroit Park and Eckington neighborhoods. By 1892, the reconfiguration of Bloomingdale was underway, as large estates had been consolidated and reconfigured into the predecessor to the modern neighborhood, with further development of the neighborhood by 1894. During this time, roads corresponding to the grid system of Washington’s streets were improved, curbed, and paved. Streams and creeks were buried or re-directed, most notably the Tiber Creek, much of which had already been buried south of Bloomingdale in the original City of Washington. Construction on some of the earliest homes were completed between 1892 and 1900. Many of Wardman’s first homes incorporate elements of Richardson Romanesque architecture (a sub-category of Victorian). This can be seen in the ornate floral and vine-like stone carving around doors and windows of many Bloomingdale homes. Many homes in the northern section of Bloomingdale still retain carriage houses in the block interiors. Some have been converted to private residences. During the late 1990s – a period of rapid change – numerous new businesses have opened in the neighborhood, primarily restaurants, bars, and food markets. These include Windows Market, Big Bear Cafe, Yoga District, Bacio Pizzeria, FieldToCity, Rustik Tavern, Boundary Stone, Aroi Thai Sushi Bar, Grassroots Gourmet, Red Hen, and Showtime Lounge. Every summer, the Bloomingdale Farmers’ Market operates on Sundays on R St between Florida Ave and 1st Street, N.W. The main park is named after Crispus Attucks, an African American who was killed in the Boston Massacre and is often regarded as the first person killed in the American Revolution. Capital Bikeshare will soon have a station in Bloomingdale. Get to know Bloomingdale better with our featured images and videos.